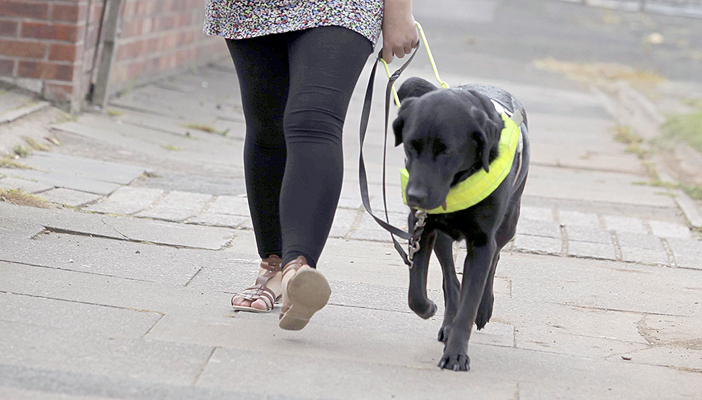 Guide Dogs names Manchester worst city for pavement parking following latest research. New research released by the charity Guide Dogs identifies Manchester as the worst city in Britain for pavement parking. The charity is calling for dangerous pavement parking to be outlawed, with the research being released ahead of a key debate on the Pavement Parking Bill that took place in December 2015. Badly parked cars are dangerous for people living with sight loss, as they are often forced to step out into the road without being able to see oncoming traffic. The poll demonstrates that there is wide-spread support for a new law that would prevent dangerous pavement parking in areas where it had been identified as a problem, with 76% of respondents across the ten cities saying they would support such a law. However, the poll also showed that when considering where to park, drivers admit that pedestrian safety can be a low priority compared to other considerations such as legality or convenience. Pavement parking has not been allowed in London for over 40 years, although the regulations include specific exemptions. Guide Dogs believes this approach works well and is leading calls for a new law that would implement a London-style system across England and Wales. The bill was withdrawn at the end of the debate and will not progress any further, but the Government has since announced that it will be conducting a policy review into the problem to consider how a law could be put into practice. The path to a law on pavement parking has never looked clearer. If you would like to support the Pavement Parking campaign in England, Wales and Scotland, take action on the Guide Dog website.